Provide comfort for the family of Joyce Swalm with a meaningful gesture of sympathy. 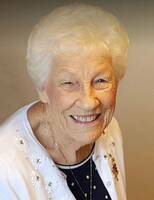 Mrs. Joyce Elizabeth Swalm passed away on Saturday, January 5, 2019 at the age of 90 years. Arrangements in care of Heartland Funeral Services, 5226 - 46 Street, Olds, Alberta. To send flowers in memory of Joyce Elizabeth Swalm, please visit our Heartfelt Sympathies Store. Provide comfort for the family of Joyce Elizabeth Swalm by sending flowers. My thoughts are with you and your families at this time of sadness. Joyce will be missed. Adolph & I valued and loved both your parents. Joyce was especially loved by me as a dear friend. I wish that I could be there to pay my respects and tell you in person how valuable your parents and your family was in our lives when we were in Didsbury. Love to all of you.